MODBUS is used for serial communication protocol used for communicating the Modbus supporting devices with PLC. Before configuring Modbus in CP1E let us understand a little about MODBUS. What is MODBUS? Modbus is implemented using the RS485 port and communication between the Master and slaves is through the data format. In Modbus network, 32 slaves can be connected with a unique node ID from 1 to 247. There are many variations of Modbus like Modbus RTU, Modbus ASCII, Modbus TCP etc. But modbus RTU is mostly used to communicate with PLC. To setup Modbus Communication in Omron CP1E, we have to make some settings. First of all CP1W-CIF11 is required i.e RS485 Port and you have to set its DIP switches. Since it will be a 2 wire connection so put all the DIP SWITCHES ON except Dip Switch number 4. See below table to know DIP switch Setting for MODBUS Communication. Note:- Click on the photo for a clear view. Also, take a look that how CP1W-CIF11 RS485 port looks. At the front side it has 5 terminals for the connection and at the back side, it has DIP switches. Front side has 1)RDA- 2)RDB+ 3)SDA- 4) SDB+ 5) FG namely. Connect two wire on 1 and 2 or 3 and 4, and shield to FG. Remember always use a shielded cable in MODBUS communication. Connect as shown in below diagram. 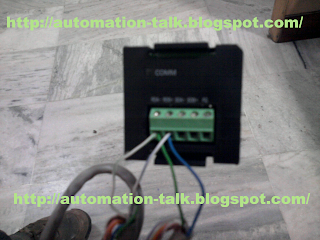 Connect the other end of wires to the device which u want to communicate in MODBUS. Always remember to connect "+" with "+" and "-" with "-". Now all the necessary hardware settings are down, Now we just need to do some settings in PLC. Just Open CX-Programmer and select CP1E model. After go to Project Workspace and right click on settings, select the serial-option port tab and in mode select MODBUS RTU Master and baud rate as supported by the slave side. Remember baud rate should be same on both the sides. After making these settings save it and download settings to PLC and re-power PLC. Hurry !! 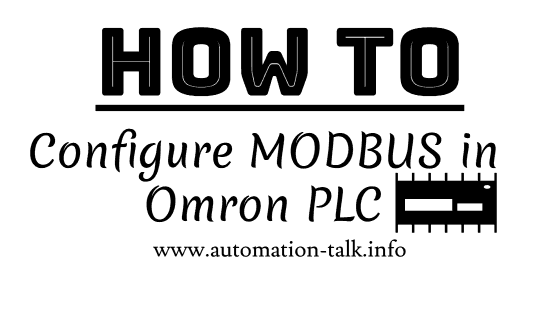 now your CP1E is ready for Modbus Communication, all you need is that connect the slave modbus devices which u wish to connect in MODBUS network. See below picture for settings. All the Modbus supporting device follow this standard format. In Cp1E fixed DM words are defined for sending these data format to slave devices. DM1300-DM1399 are used for this purpose, once you write the desired format then just on the system bit A641.0 to send the above query to the desired slave device. We will discuss it in depth in the next posts as how to communicate with drives, HMI, Energy Meter etc. in MODBUS with our PLC and how to read & write data in them . So Keep reading here and if u have any doubts you can contact us or leave a comment and we will get back to you as early as possible. Don't forget to subscribe to Automation-Talk by Email for more such tutorials. yes surely we will help you .... send us the detail ...which delta hmi you are using and how you want to communicate ....in modbus or via rs232 serial.....? i am using dop-a series hmi and omron cp1e plc. want to communicate thro modbus rs 485. I think you should not have any problem in there communication. Just connect your CP1E Modbus Connector CIF11 to Delta HMI Modbus port i.e positive to positive and negative to negative. which data you want to set in PLC?? is urs connection in MODBUS OK?? first assure that and then proceed. press I and type MOV #1 d1300 and so on for remaining . External connection OK. cp1e cif11 comm.indicator flikering. Generally in MODBUS when we read the dat from slave device then we add 1 in address of register ..well it depends on slave characteristic also ...whether too add or not ...but most of cases we have to add 1 and subtract 1 while writing the value..
in which......i want to select on particular controller. then only it work correctly. pls sort out this . Ok Means your HMI software needs controller Name. Please choose C series Controller. CPM1A should work. i tried out c-series, it doesnt work. send me plc and hmi sample program. ok. i will try this......will come back soon. thank you.May i know you name. We are Automation Talk Team. TIME DELAY WHILE SENDING/ RECEVING DATA. WHILE CHECKING ERROR LOG, I FOUND CRC ERROR. We generally don't use CRC. also connect shield to FG terminal in CIF11 port. delay generally is due to noisy environment , so use shielded cable and connect to FG. for CRC ISSUE ... see the manual of DELTA hmi ..it will be there ...if not then try putting CRC AS 778D ..not sur it will work or not as every slave device has its own crc ...so better read manual carefully. let us know how u want to communicate ... through RS232 or ....device net .. compo way ? which port u have at plc side? thro compoway--------Com port 2, rs 485 in Delta PLC. Use Shielded Cable , connect + of Delta Rs485 with terminal B and - with terminal A.
Sub Address - Put this as 0. SiD - Put this also as 0. FINS-mini Command text :- Here write text command. ETX :- Put this 0. BCC :- It will be value resulted from EX-or Operation of values of STX to ETX. send sample program using schedual interrupt and inbuilt interrupt. I want to connect with a rs485 device with a cp1e with cif11 instaled,i've configured the cif11. HOW CAN I MAKE THE CHECKSUM? AND WHERE IS THE CHECKSUM? D1305? D1306? CRC you can find in slave device manual. CRC will be in the last word of your query to slave device. I will connect plc omron CP1L premises inverterfrenics use rs-485 interface, how to make a ladder and settings in omron plc and settings in the inverter? pls let me know...omron CP1E-N30DR-A will work as slave with SCADA? @Malkeet > You are communicating through which protocol ?? What could be reasons for A641.02 error flag (CP1E case)? Is it wrong wiring? Wrong communication settings? I am trying to make CP1E-N (Modbus Easy via CP1W-CIF11) and Toshiba VFNC3 (Modbus RTU) speed drive communicate with eachother but get this error flag all the time. Cabling should be correct, I have tried with different comm settings, no result. @Deathster > Have you set your CP1W-CIF11 connector. @deathster Hope you are using correct serial option port setting as shown in above image. The setting should be same in PLC and as well as in modbus RTU you are using. Please also check for any loose wiring if its is OK, then you can do a polling test. Also if every thing seems fine from PLC end then please check your drive for Modbus setting. You may have to power on and off after saving settings in drive. Same problem with CP1E and MX2, can not get them to communicate /A641.02 is on) although port/software/physical settings are done properly. COMM led is not blinking at all. I did com port reset A526.01, no result, still no communication. I started to think whether CP1W-CIF11 is defect and connected with Weintek HMI (via same port but Hostlink protocol and this way I get communication between CP1E and HMI, so CP1W-CIF11 is ok). D1352 has 0004hex message which means there is no comm board (there is!) or comm mode is not Modbus-RTU Easy Master (both CP1E and MX2 have same settings). Please check http://2.bp.blogspot.com/-qTMkY-2S35I/UIk4CRAJ_kI/AAAAAAAAFz8/GDefO8TI_KM/s1600/CP1E%2BDM.png for DM Words. I we are missing some thing. It should be working. Please read how to set MX drive modbus setting. We also have same issue once. Please check below link. I am sure it will help you. How can I do for have my CP1E-NA20 as a Modbus SLAVE ?? Andres Please check above steps. I did it, but as you can see the article explains only the Master side configuring the serial port as MODBUS RTU MASTER. How about the client (slave) side? How can I configure a PLC CP1E as Client ?. I want to use a cp1e nn0 plc with mach3. any programs or with examples that can help me will be appreciated. we are using a PLC omron CP1H with card RS232 to communicate a a Master IHM via Modbus RTU. could you recommend us the most used FB modbus RTU slave for this case. if you have any example, please send us. please someone help me how should i read set of values coming from external device and how to store those values in memory.i need a program. I can communicate with a single 3G3MX2 drive I am using the registers D1300 to D1304. But How can I communicate with multiple drives at a time? I have the Modbus RTU device. it is supported by Modbus RTU protocol via RS485 communication. I have successfully connected this device to HMI NB10W-TW01B. Now I want to connect PLC CP1L-EM to this device and get data from device. I do same anything like this post above, i also turn on bit A640.00 in Cx-Programer but it not work. I think the problem is "Device address --- function code -- data -----error check"
Have made correct ladder login to get values from Sensor? Check above comments, it may help you. The adress of sensor from 11 to 17. After connected sensor to HMI and set up parameter for them, in NB designer, i used " Number display" to get data from Sensor. In component Number Display, i used "4X11, 4X12.......4X17" to get data and data will display on HMI. Looks correct, we will request to check everything from starting. Connections, PLC logic, MODBUS. hi.. can anyone help me how to read data from Weighing indicator.. they using Rs485 and I using cp1e n30 and the option board cp1w cif11.. all the setting is on position except no 4..switch off.. either have any program to read reviews data..
Hello, I am currently doing a project to read and write PLC (CP1E-N20) coil from my PC using HMI software (Indusoft). I want to try communicate using MODBUS RTU, with PLC as the slave. PC are connected via Serial-USB cable to the PLC built-in RS232 port. Can email me an example PLC ladder code/program I can try? My email is umar9876@yahoo.com. Thank You. Could you please sent me a sample PLC programming for read and write data from two power meter using modbus ? I want omron cp1e as master and nb design as slave via rs 485.And also display some digit inn hmi or high a bitlamp. what will be the program in cx prgrammer. I try it but does not display anything in hmi. Is it possible to make cp1e plc as modbus slave through cif11 on rs 485? plz suggest what to write in the program to do so as i have to give data to bms on rs485 modbus?